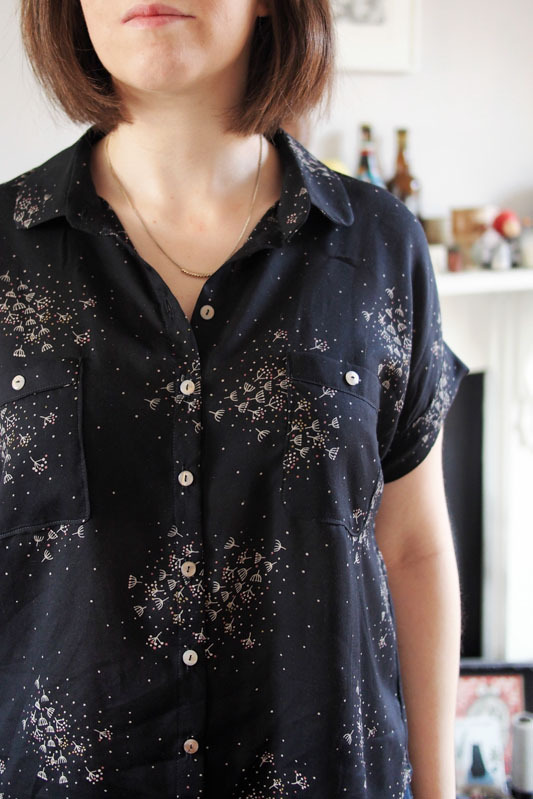 Since making the By Hand Sarah and discovering that button-down shirts do in fact have a place in my wardrobe, I’ve bought up a couple more shirt patterns for a bit of variety. This here is the Deer and Doe Melilot, from their latest collection, Botany. 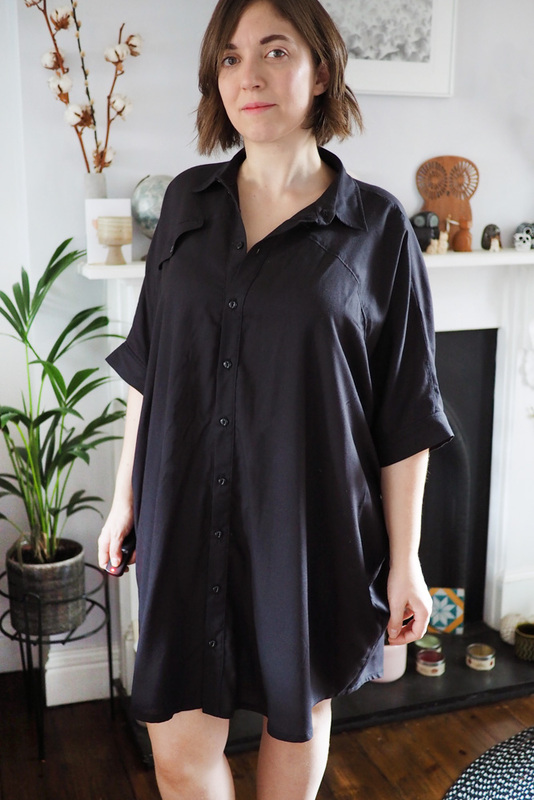 I wanted to try this one in particular because it’s kimono-sleeved which I find more comfortable and casual than set-in sleeves, and it’s got a traditional stand collar which means it can be worn fully buttoned or at half-mast. I made View B but with the collar from View A. 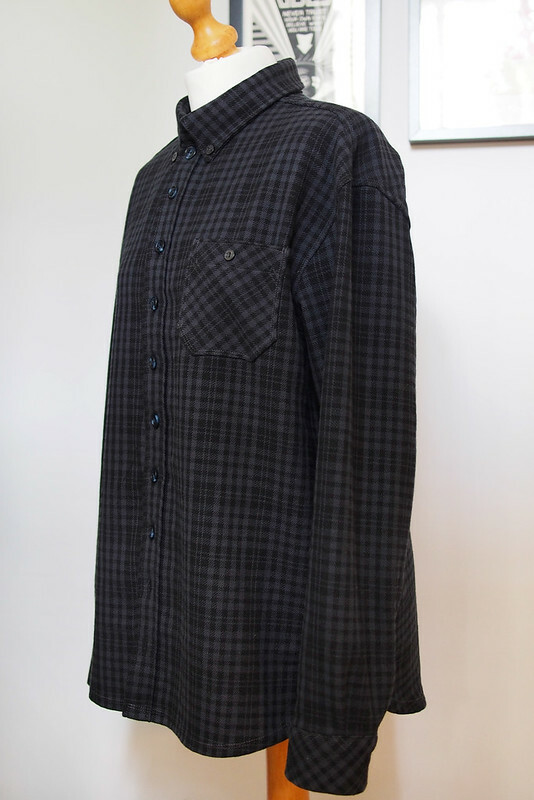 From looking at the final garment measurements, I cut a size 44 because I like my shirts on the oversized side and it’s designed to be more fitted. I also added an inch more flare at the hemline on both front and back to make extra sure it’d fit my hips. The fit is nice and comfortable but next time I think I will bring it in at the bust as there’s a bit of excess fabric bunching under the arms. 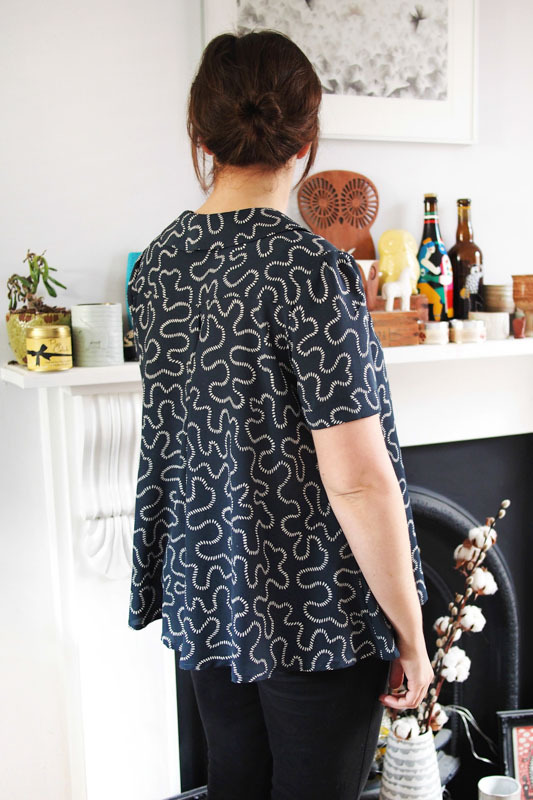 I love the exaggerated dipped-hem look of the pattern but it stuck out in a weird flappy fashion over my bum, so I took up the hemline by about an inch on the front and 2 inches on the back. 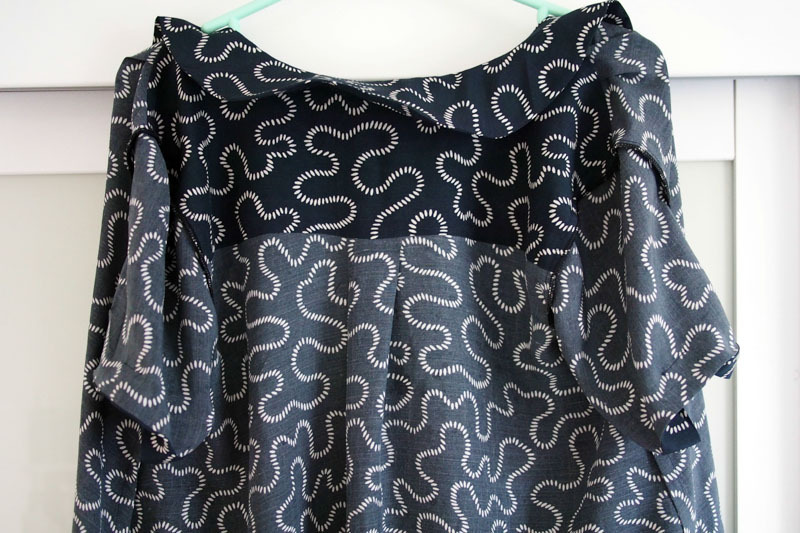 In doing this I also smoothed off the curviness of the hemline, making it easier to sew. You’d definitely struggle to do a turned hem, even a narrow one as suggested in the instructions, so next time I will probably use bias binding to finish the hem instead. Otherwise the instructions are good and it’s all finished with French seams and clean finishes, with no overlocking in sight. 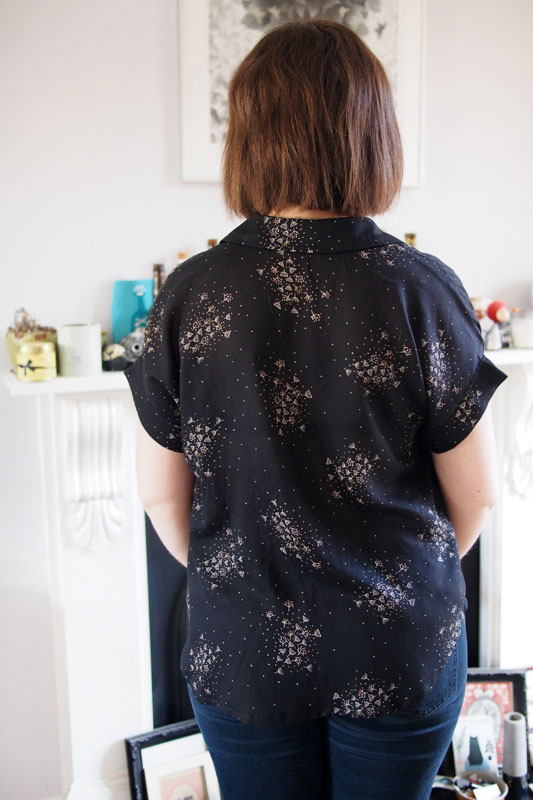 It’s a double French blouse because as well as using the D&D pattern, the fabric is from Atelier Brunette and bought on my recent trip to Paris. It’s a very lightweight cotton voile called Lili, which was a mixed bag to work with – it pressed well but was shifty and slippy. 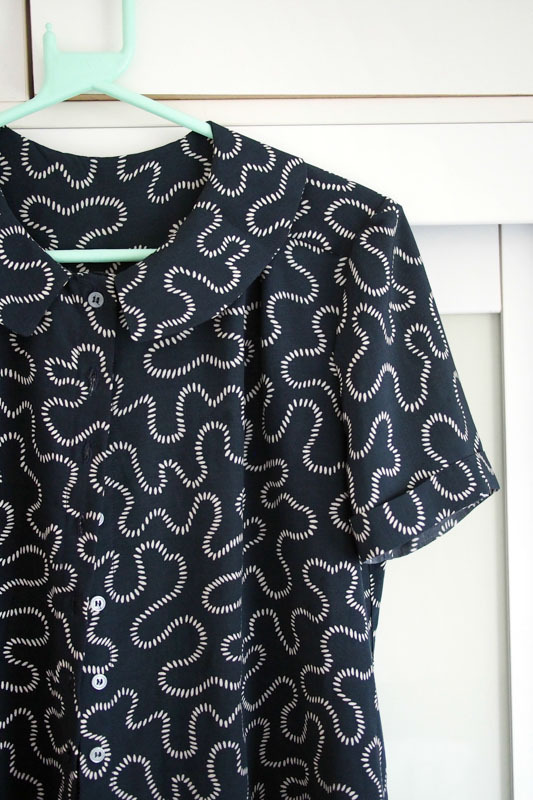 One of those makes where the pattern and dark colour hide a bit of less than perfect stitchery, ha (although I promise the pockets ARE straight and aligned, it just droops a lot on the hanger!). 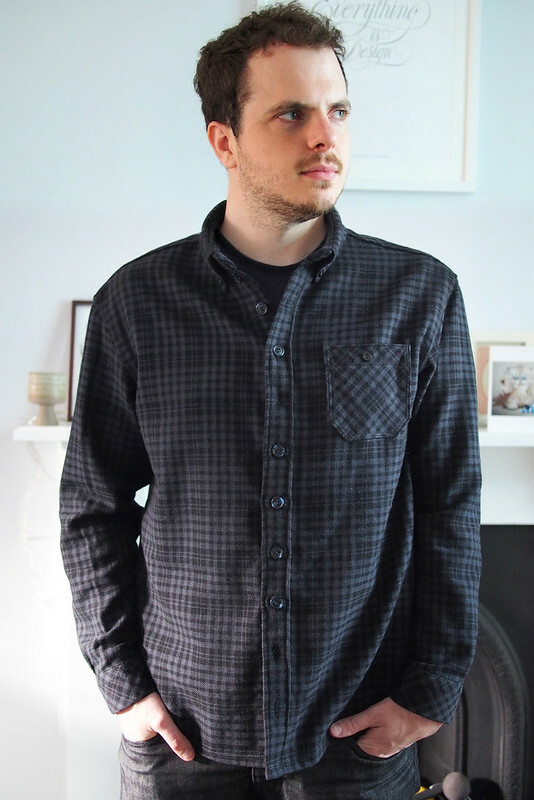 As you can see the fabric creases a bit with wear, but as it’s a causal shirt I’m OK with it and it’s very soft and comfortable. The pretty pearly-peach buttons are from my stash, a perfect match for the seed-head pattern on the fabric. I put fake ones on the pockets to help them stand out a bit. 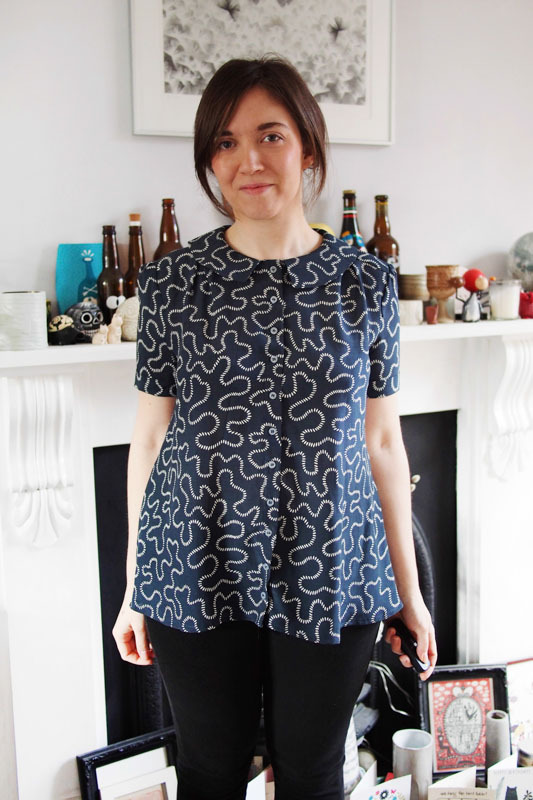 This was fun to sew despite the slightly difficult fabric – a nice bank holiday weekend project. After making a couple of small fitting alterations I’ll definitely make another one in a solid colour, perhaps a grey sandwashed silk. Hey hey! 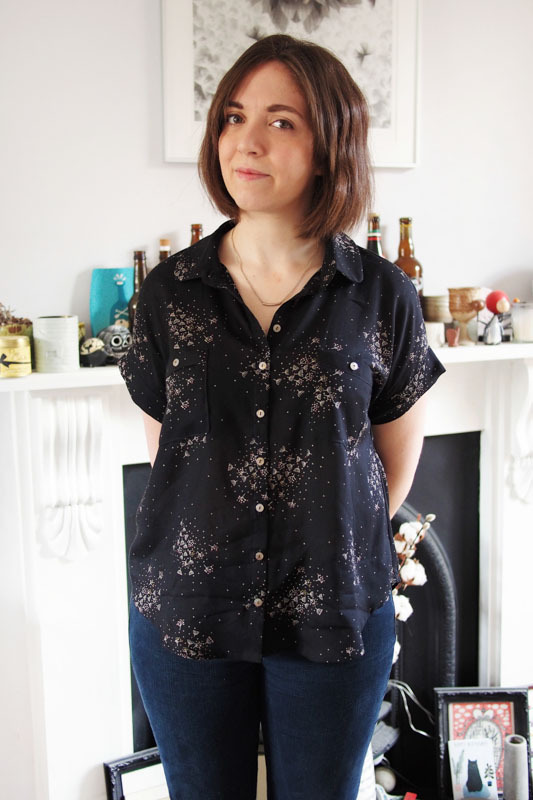 Sharing my new shirt today, which is By Hand London’s latest release, the Sarah Shirt. It was released yesterday, but don’t worry I’m not that fast: I helped the girls out on the pattern development so got to sew it up pre-release. 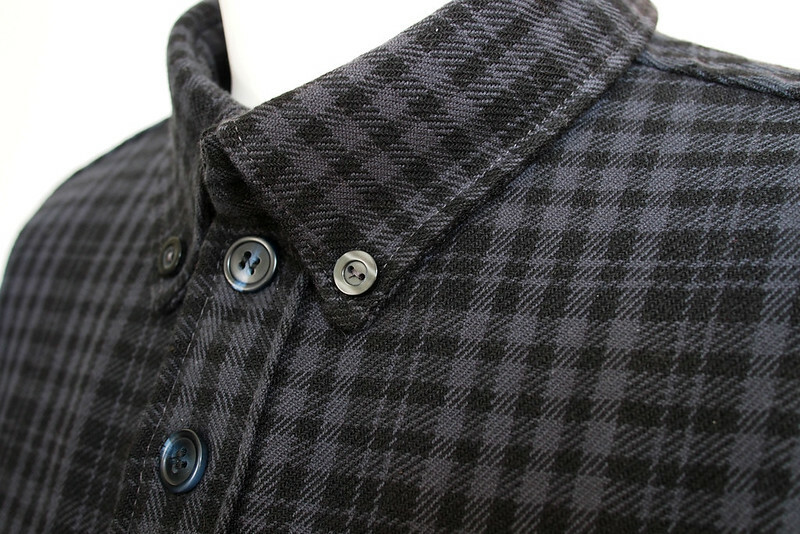 Now if you review my previous projects you’ll see a serious dearth of button-down, collared shirts. They’ve just never been my thing, but I’ve been trying a few new shapes and styles lately (turtlenecks, wide leg pants) so thought it was time to give them another go. And I like it a lot! 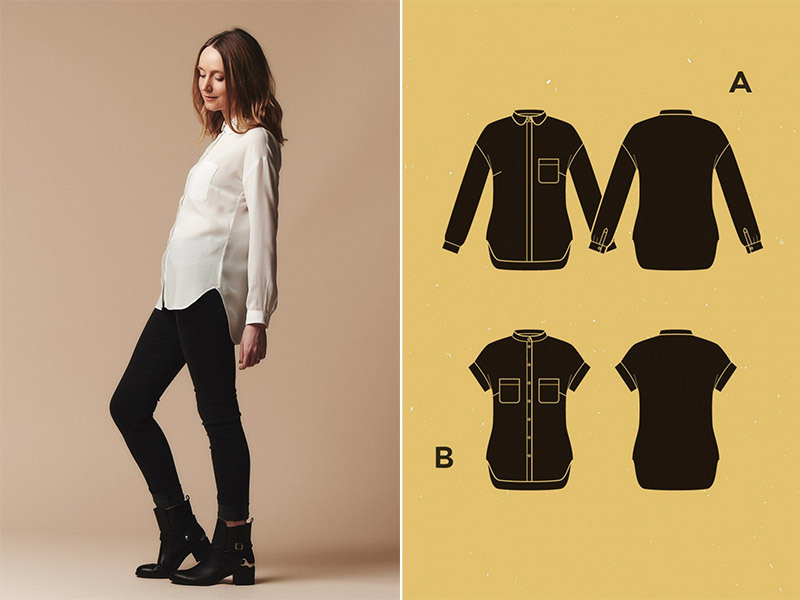 Sarah has two views – one with long, full sleeves gathered into a little cuff and a rounded collar, and one with short cuffed sleeves and a pointed collar. Both have a super-swingy flared shape with box pleats on the front and back yokes – the big bonuses of this silhouette being extreeeeme comfort and very easy to fit. I cut a straight size 8/12 of View 2 and the fit is pretty good, even without making any of my usual BHL adjustments. It’s great for us pears as the shoulder/bust fit is nice and snug while flaring over the hips and bum. Next time I’ll do a full biceps adjustment as the sleeves are a wee bit tight, but not unbearably so. (nb. 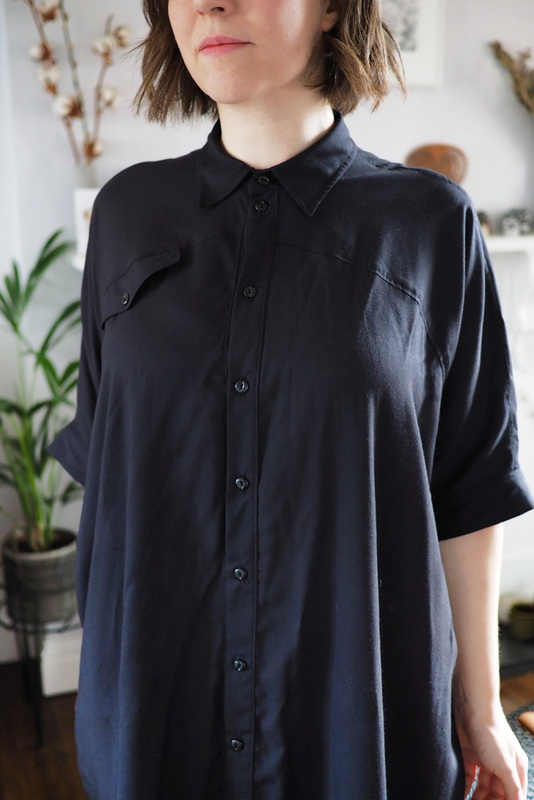 it looked really cute sleeveless before I added them – potential future ‘hack’…) I’d also use less stiff interfacing in the collar – it was all I had to hand but it should definitely be lighter weight as it doesn’t want to lie completely flat. 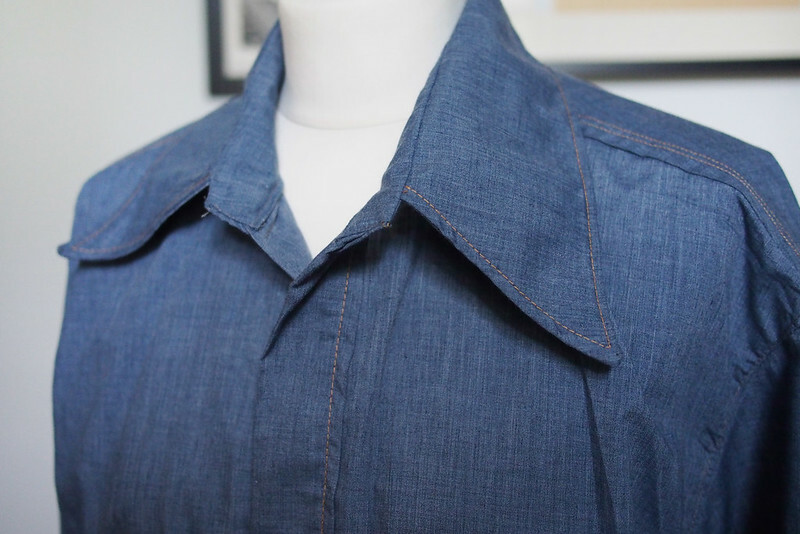 The yoke is sewn burrito-style for a clean finish and the collar needs a bit of handstitching on the underside but winds up nice and tidy too. I used French seams throughout except the armsyces which are overlocked. I’d call it a weekender type of project – not too taxing but enough detail to keep it interesting. And I hope if you buy it you like the instruction booklet and tech diagrams, because that’s mostly my handiwork…! My fabric is a lovely lightweight silk that I’ve had in my stash for ages after scooping it up in a House of Hackney sample sale. I bought a lot of it so I’ve still got enough left for another project. 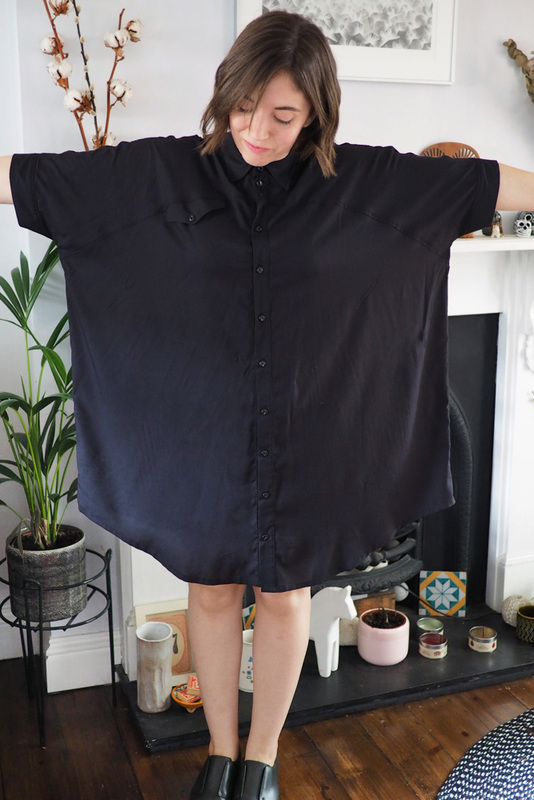 I think you’ll need something as drapey as you can manage for this shirt so you don’t get a stiff sticky-outy lampshade effect. Spray starch would be my pro tip to make cutting and stitching floaty fabrics easier. I like how it looks with all the swinginess tucked in too! 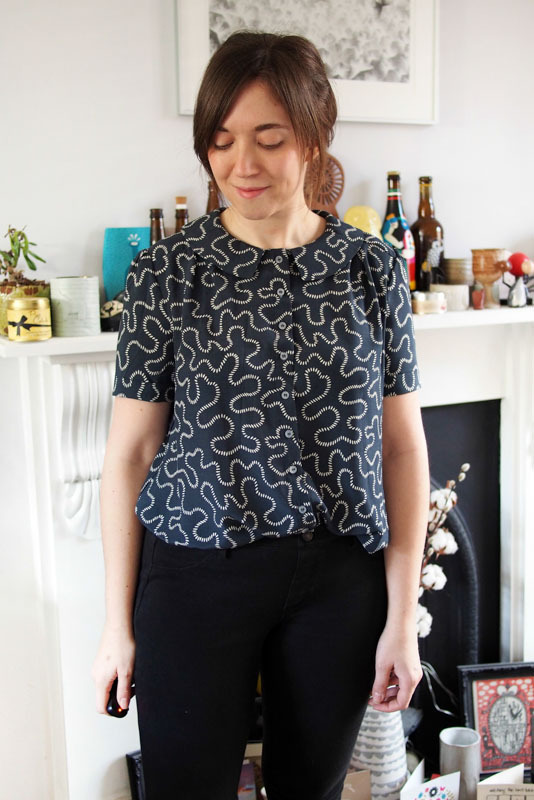 I’m really glad I got a little push to try a new silhouette – it’s been worn to work and on an evening out to the opera already, and I might make a second in a solid colour. 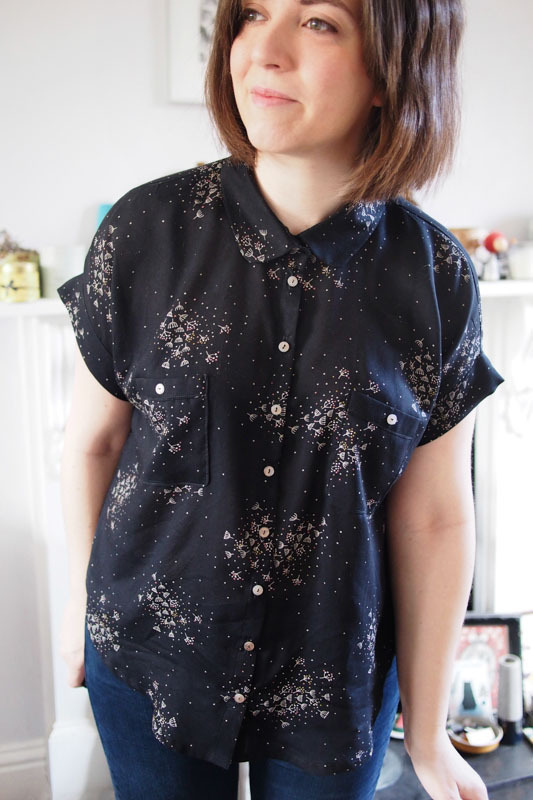 You can pick up the Sarah PDF pattern here. Are you a fan of the swing? Phew, finally a non-jersey and non-stashbust make! 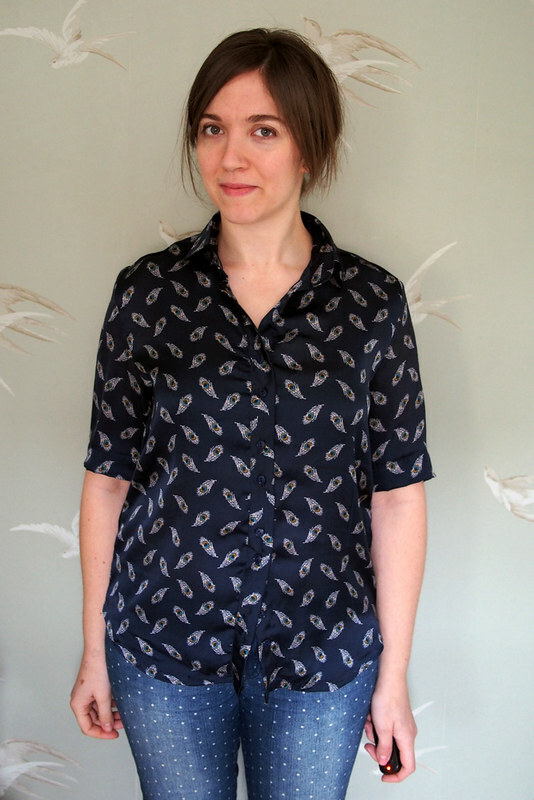 For this month’s Minerva project, I picked a beautiful peacock-feather printed navy satin to make my first Grainline Archer shirt. (Weirdly my next three upcoming Minerva makes are all varying shades of blue, but unlike the last three months this is the only patterned one.) This satin has a lovely sheen and handle but sewing with it was a new challenge, especially for a shirt. It’s super slippery and slid off-grain at any oppurtunity. Luckily I’d read a tip to cut such fabrics through a layer of tissue paper or newspaper, and this made it much more manageable. I also used thin silk pins to avoid marking the delicate fabric. 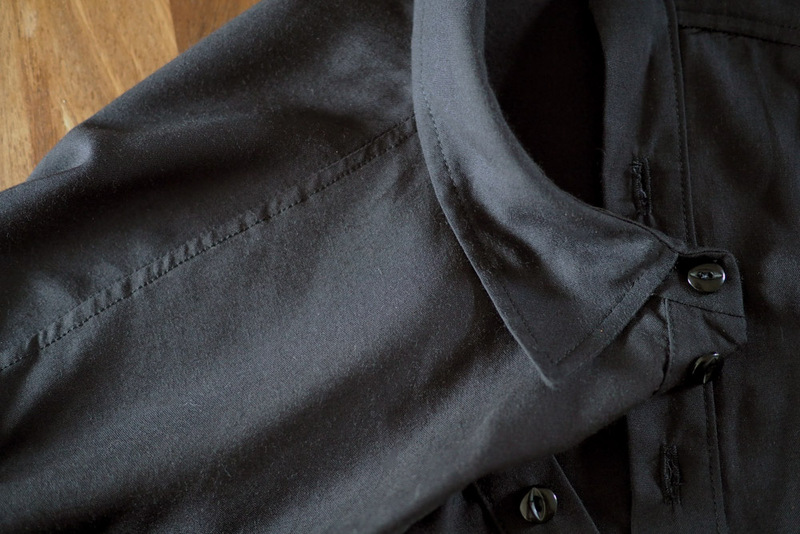 The pieces were much easier to deal with once interfaced, and a liberal helping of Aqua Glue was my saviour whilst sewing the button placket and collar. The Archer pattern itself was a breeze. It probably helped that I’ve made two shirts for Josh already so the construction steps were very familiar to me. I also cut some big corners by leaving off the pockets and sleeve plackets/cuffs; I just couldn’t imagine getting them remotely accurate in the satin without having a nervous breakdown. 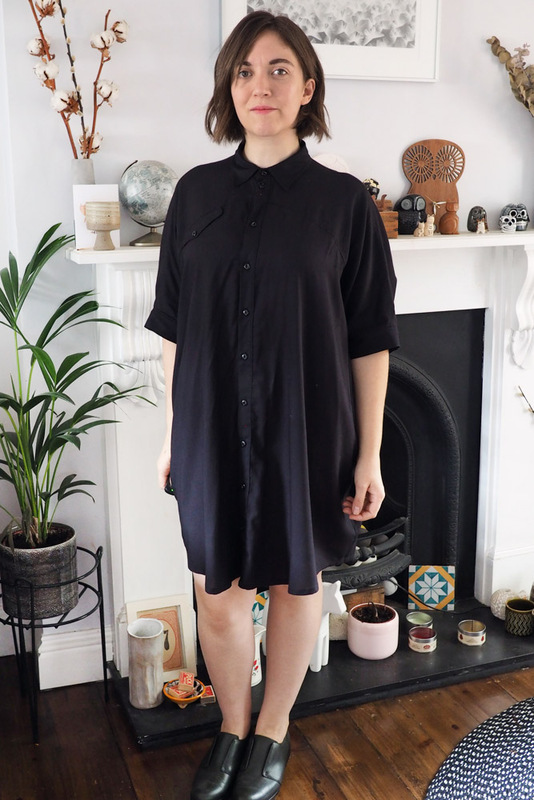 Instead I went for an above-elbow length sleeve with a deep cuff to try and mimic the look of the sleeves being rolled-up (how I always wear a long-sleeved shirt anyway). 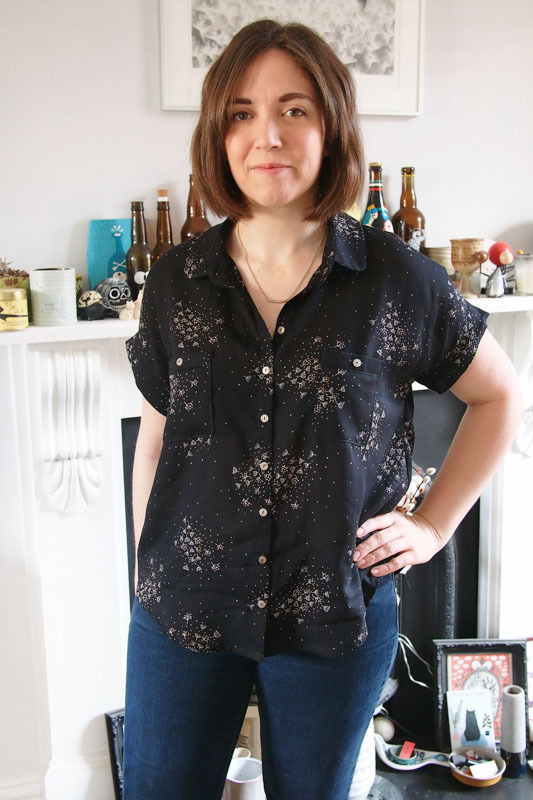 I like how this gives the silky shirt a more laid-back look – almost like that dressy-pyjama trend of last year – and it’s easier to layer up with a cardigan which is pretty essential in February. I tried to do that two-by-two button effect but my spacing’s a bit off, they just look a bit uneven. 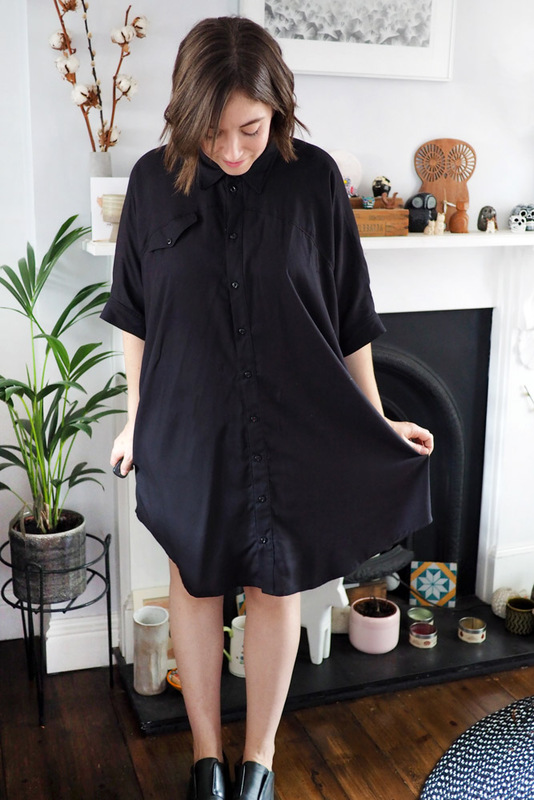 The size I picked was pretty perfect out of the box and I love the dipped back hem: I want to try the ruffled variation sometime too. 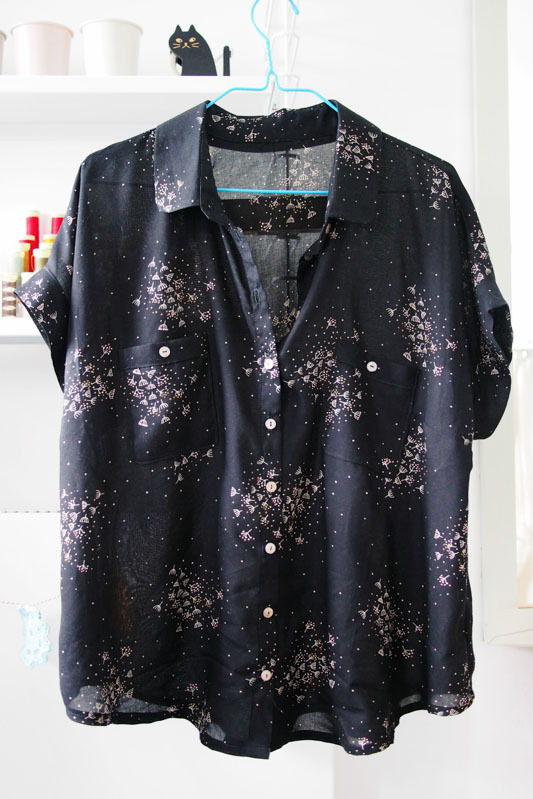 I’m glad I persevered with the fabric as I love the final shirt and it’s seen a few wears already. 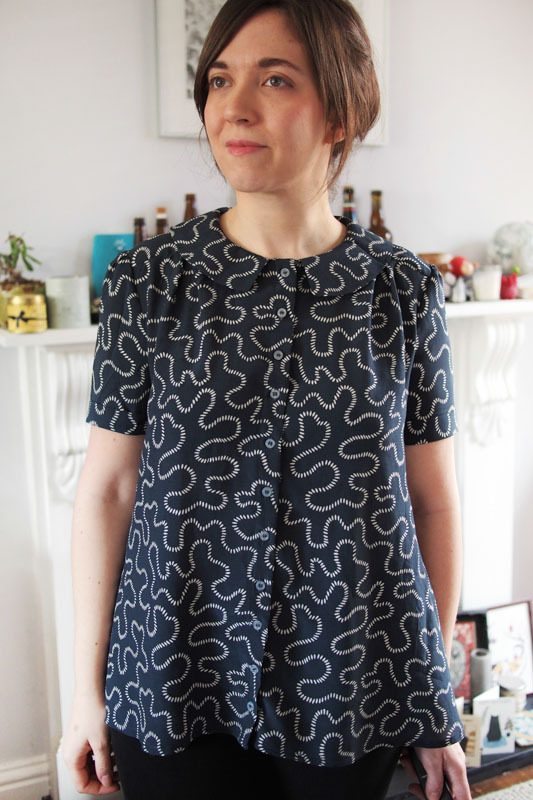 As ever, you can buy the kit for this make – containing fabric, thread, buttons and interfacing – for just £18 from Minerva here. 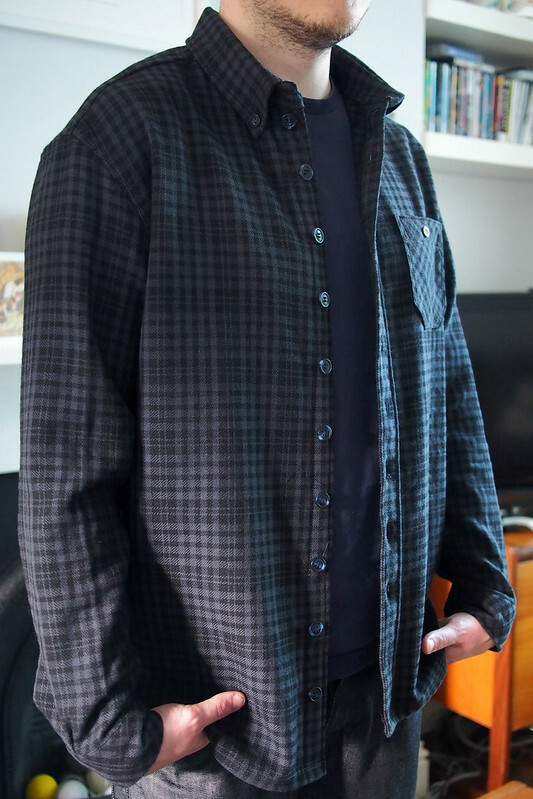 I finally got Josh’s shirt finished up, just in time for his birthday yesterday — I actually sewed on the final buttons and made him pose on the very day. I think we’re both pretty happy with how it turned out. (Excuse all the cat hair and dust, it needs a spin in the wash.) I used the Burda Jakob pattern, a semi-fitted style with a full stand collar, buttoned cuffs, curved hem and chest pocket. 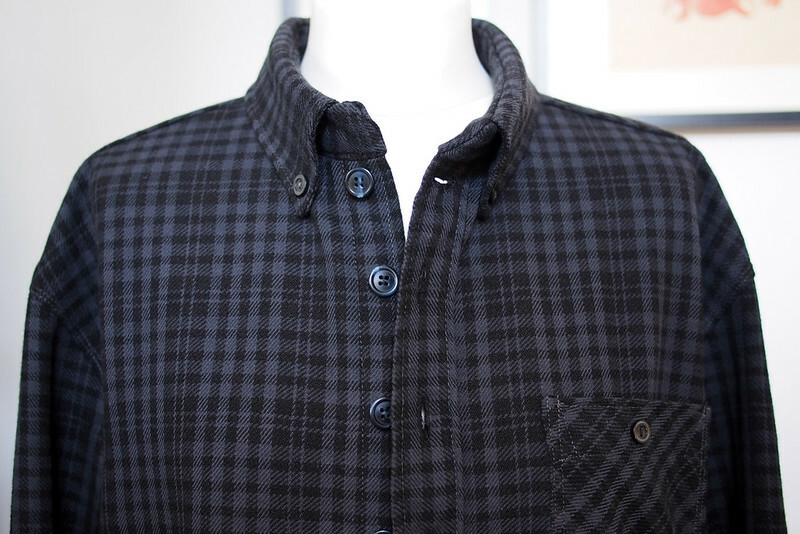 As I mentioned before, Josh picked out the wool plaid when I bought the fabric for my coat from Dalston Mill. It was quite pricey, so I made sure to take my time and do a good job with it. I made a toile out of cheap polycotton first to check everything made sense and that the fit was right. Not many adjustments were needed from the medium size, just shortening the body and sleeves a little (I took most of it from the cuffs since my client wanted them narrower anyway) and reducing the ridiculous Seventies-disco collar considerably. The construction was really quite fun as well as satisfyingly challenging in parts. 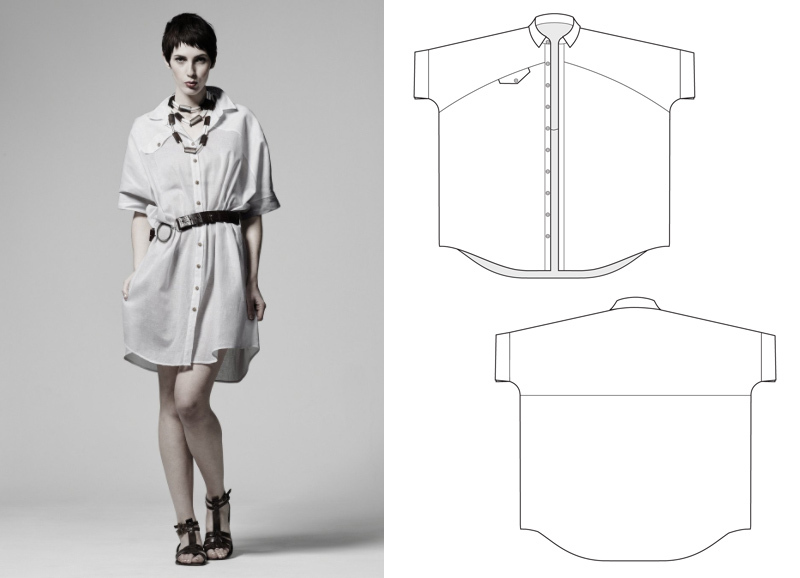 The pattern is perfectly drafted and unusually for Burda the instructions are clear and thorough, with photos and diagrams throughout. 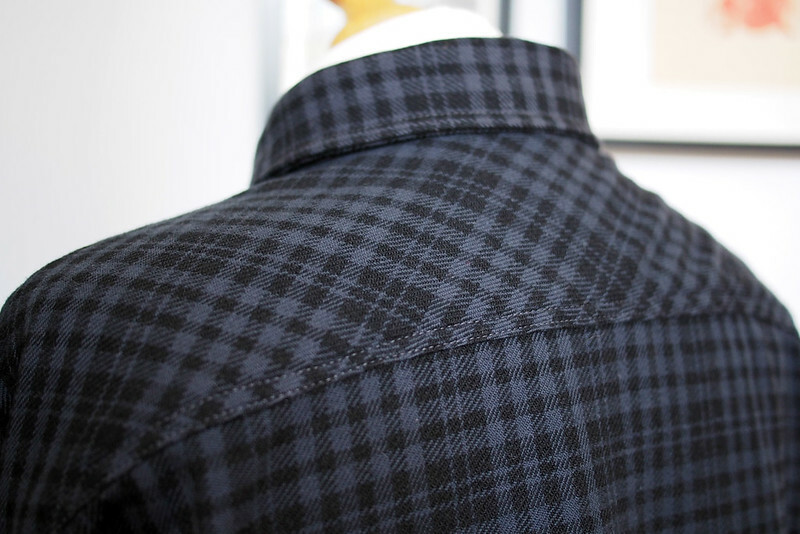 I especially enjoyed the really nerdy details like matching the checks, careful pressing and topstitching and doing neat mock flat-felled seams throughout. I would have liked to do true flat-felled seams inside for a really pro finish, but they proved tricky in this fabric. I supplemented the instructions with some of the Archer sewalong steps and Andrea’s superb alternative method for setting in a collar which worked a treat. I redid the collar once because I overcompensated and cut the first one too narrow, and also omitted the interfacing from it the second time since it was pretty thick anyway. 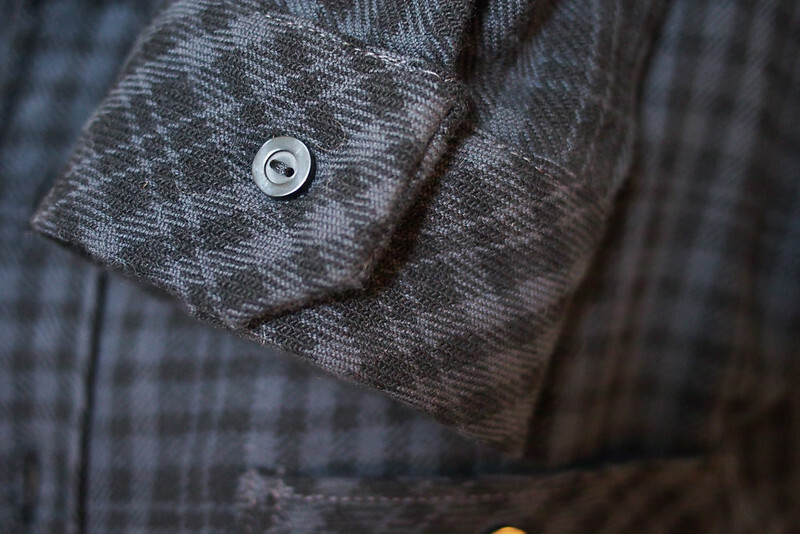 The buttons on the tips are nonfunctional, they’re just stitched down. The wool plaid Josh chose pressed and stitched up nicely, but its thickness and frayability did make the construction a bit more challenging. The collar stand, cuffs and shoulder seams are rather chunky because I was nervous to clip too much, though a bit of steam-pressing helped it settle down. I think there’s 8+ layers around the armsyce where the yoke and sleeve join which my poor machine really struggled with. All the raw edges inside are either concealed or overlocked so I feel good that it won’t fall apart in a hurry anyway. I used my buttonhole foot for the first time for all the functional buttons: together with the one-step program on my machine it makes them sooo easy. I’ll be buttoning all the things from now on! I used the machine to stitch the buttons on too, just going very slowly on a short, wide zigzag setting. Totally worked, even if it probably isn’t the done thing. 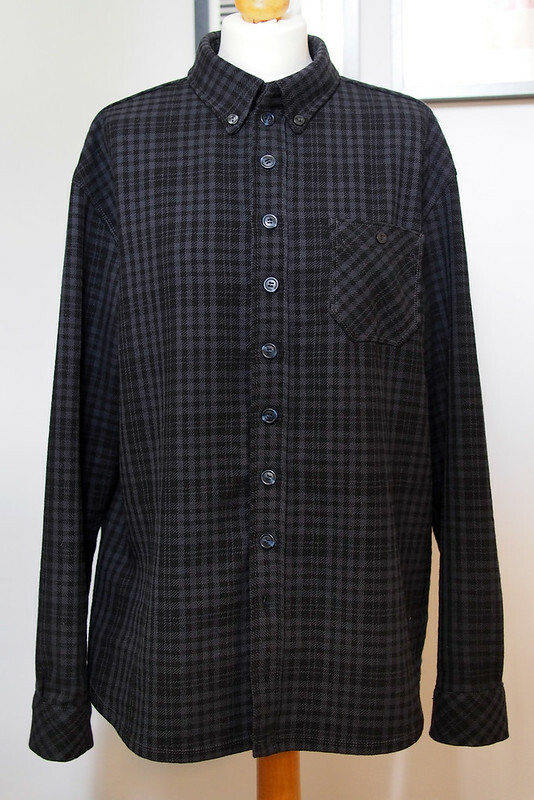 This is definitely the most precise and well-made garment I’ve made so far, probably because I was making for a harsher critic than myself (not that Josh is harsh, I’m just pretty lax) and I really wanted to make a shirt he would love and wear often. It seemed to take forever compared to my usual makes – about ten sessions over about a month – but I quite liked the change of pace. I even put the speed limiter on my machine, and I can see the difference in neatness and accuracy when I go slower. Definitely a lesson learned going forward. 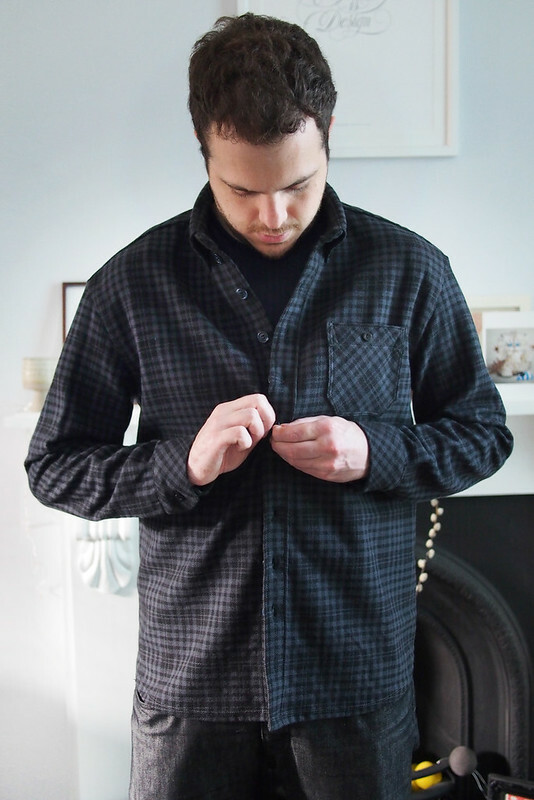 I’d like to make him another shirt in a lighter fabric like a flannel, now that I know this pattern is a good fit and fun to sew.